The night before I started, I’d questioned myself a little. Why was I doing this course when we still lived in a small flat in a very busy city? Wasn’t this the sort of course that you did when you had access to land or at the very least, had a small back yard? The next day, listening just ten minutes in to Nick Ritar from Milkwood speaking, I knew I had made the right decision. This was definitely the course for me. It was one of those moments where I had felt simultaneously like laughing and crying at the same time….that’s how right it felt. My dreams of living elsewhere in a far less big city fashion, have been whole heartedly renewed. However I’ve also been totally inspired to do more where I am, in this very moment as well. Living by permaculture principles is totally workable in an inner urban environment, not only workable…it should be compulsory. Can you imagine if permaculture was a subject taught in all city schools along with reading and maths? A subject that was just naturally incorporated into our learning curriculum? Changes people, massive changes, and I can’t see how it would be anything but overwhelmingly positive. So what am I going to do with my newly permaculture exploded brain? I am going to run with it. I’m going to start with some teeny tiny changes that are going to make an impact on the way my family and I live, and then I’m going to hopefully branch out a little and slowly shake things up. I’ve got dreams again and I’m not afraid to use them. This entry was posted in Connecting with Community, Going Green and tagged milkwood, permaculture, sydney by cityhippyfarmgirl. Bookmark the permalink. excellent……………run as far as you can….Im about to move from a big city back to a rural setting and I cant wait Im counting down the days. But youre right about getting started there is lots that can be achieved and then when you can build on the skills aquired when you relocate somewhere that allows greater permaculture practice. Now I’ve heard this about permaculture: that it can inspire you where you are already. I’m going to look into this and I look forward to hearing more about your adventures Brydie. Rose you would love, love, love it. I’m sure of it. I did my PDC with Milkwood. It changes your life and I now do consulting and help others do the same. Love to hear about your changes. This sounds very exciting. I’m looking forward to following your journey. Although I have an allotment where I am lucky enough to have a bit of dirt to dig in, I live in a small inner-city flat too and would love to hear more about permaculture principles for folk like us with a tiny balcony. Lead on Macduff! I think there is a lot you can do with Permaculture in a small space but it’s hard to know where to begin & because the results aren’t instant or 100% (like chemical sprays are for example) it’s hard not to get impatient. I’ve just been over to the Milkwood website and I’ve been lost in it for half an hour. So interesting. You’ll have a great time. 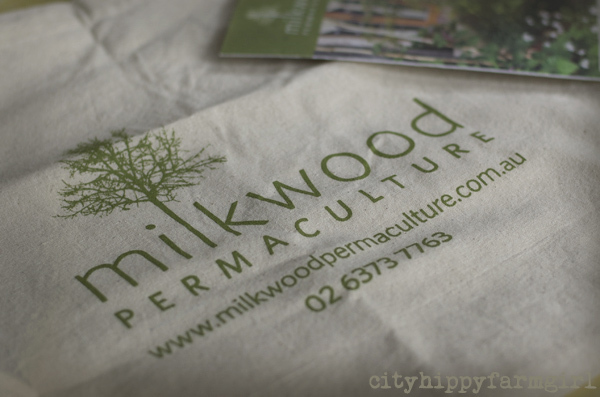 I did an Urban Permaculture Design Course with Milkwood in April this year – and I felt EXACTLY the same as you – so inspired and so much like crying and laughing because it all felt so right….if you ever want to swap Permaculture experiences/questions/aha’s I’d love to! Milkwood are pretty darn amazing – that definitely won’t be the last course I do with them! I might just take you up on that Becs. So good to hear from someone else that felt the same way. I love that you will make this work for you! Oh, so exciting – please share with us what you do and what you learnt? I’m inspired just by hearing you type! How lovely it is to hear someone sounding so motivated and excited. Good for you! I’m very excited to see what transpires! I also did a permaculture intro course while living in a 3rd floor flat in inner Sydney. I made an imaginary garden plan for my project. Nine years later I live on an acre block in the Blue Mountains with a wood fire oven, mandala veggie garden and chook shed. Permaculture is incredibly inspirational and for me become a guiding force for lifestyle change. Enjoy the journey and dream big because you can make it happen! Narelle thank you…I loved reading that. It is wonderful to be inspired…sounds like a great course. Good on you!! I have no garden, I live in a big city but I although did a gardening course, because, some day I ´ld have yes !!!! a garden of my own, full of veggies, flowers and worms!!!!! Hi Brydie! Permaculture principles can be adopted anywhere – and yes they should be taught at schools. I dream of going to Milkwood one day…lucky you! I think that’s one of the things that excited me the most, the fact that it could be adopted anywhere. If it can be done there why not elsewhere ? In 2012 a school gardening Program was reintroduced to enhance our curriculum offerings. Students across the school are working with Jon Gemmell on creating a new section to our sustainable garden in a variety of identified areas around the school. The culmination of this program will see the new Indoor / Outdoor classroom facility erected in 2013 with classes regularly visiting the centre for science and permaculture lessons. Oh I love hearing this…thank you for linking that! Well hellooo! Absolutely wonderful teacher wasn’t he…such a great weekend. I’d love to the PDC too, and the natural building one. This looks so cool! I clicked the link and as soon as I saw the honeybees, I was interested. I am obsessed with beekeeping. If only I could get over my phobia of bees! Best of luck to you! I actually think the people who do permaculture best are former city dwellers. As a 4th generation farmer you can’t help but cling to the ideas you were raised with and it is a bit harder to move over to permaculture principles. I have friends who have moved from city to country and they teach me so much about permaculture because they embrace it so strongly. I am so glad you enjoyed your course Brydie and I know you will have some amazing posts coming with ideas in the city and hopefully one day in the country.PS Honey the goat had TRIPLETS!!!!! Having now tried both – I recon its not only possible to to live by permaculture principles in a city – but a whole lot easier. A supportive community is easier to find. Gardens aren’t bugged by creatures. Everything seems so much harder out here. 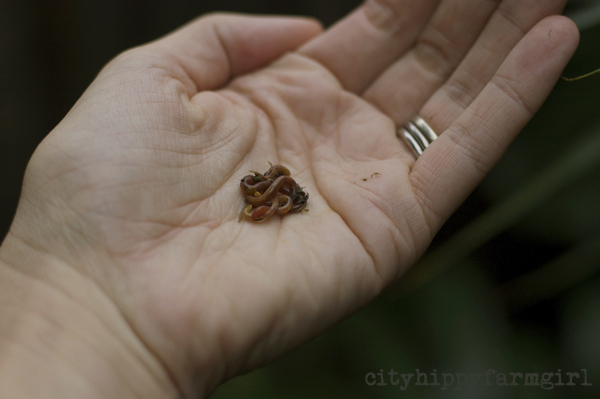 The worms right in your hand freaked me out a little bit but once I got past them, I loved this post. If only permaculture were taught in schools! How great that you left inspired! I look forward to following your journey to implement what you’ve learned, Brydie.